Apply now for Fall 2019. The purpose of this new online graduate certificate program is to meet the 150 clock training hours required by the Association for Play Therapy to become a Registered Play Therapist (RPT) or a School-Based Registered Play Therapist (SB-RPT). The program is designed for completion in one academic year with cohort groups beginning annually in the fall semester. This 7-hour graduate level certificate program meets the academic content hours requirement for participants. Requirements: Master’s degree or higher mental health degree from an institution of higher education. Participants are responsible for meeting the additional requirements outlined by the Association for Play Therapy. **Please click here to see directions on how to complete your Play Therapy Certificate program. The Rocky Mountain Center of Play Therapy Studies is one of the few approved U.S. centers for play therapy education through the Association for Play Therapy. The underlying philosophy of child-centered play therapy is that play is the child's language, and toys are the child's words (Landreth, 2002). The utilization of play in therapy enables children to communicate their inner world. Provided with facilitative toys, children bring their feelings to the surface, giving them the opportunity to face their emotional world. They learn self-regulation regarding emotion, contributing to a stronger sense of self. The counseling program at the University of Wyoming is proud to provide ongoing training, clinical practice, and supervision for play therapy. The play therapy center facilitates a bi-annual summer play therapy conference that features premier speakers and practitioners in the field of play therapy. 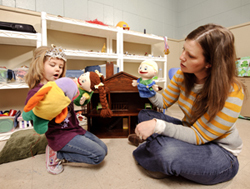 We offer graduate level courses in play therapy, clinical practice and supervision at our University-based clinic and opportunities to participate in ongoing play therapy research and scholarship. Over 200 mental health professionals, school counselors, social workers, and early childhood teachers were welcomed by the Rocky Mountain Center of Play Therapy Studies and attended the 6th biennial play therapy conference in Laramie, Wyoming during June 2015. The majority of participants were from Wyoming; however, we also had attendees come from places such as Israel and Alaska for this prominent event. Workshops were facilitated by international leaders, and participants learned about the Neurobiology of Healing through Play Therapy: Nurturing Hearts with Brains in Mind with Dr. Bonnie Badenoch. The Use of Expressive Therapies and Attachment Work when Working with Traumatized Children and their Families was led by Dr. Eliana Gil. Attendees enjoyed a dynamic opportunity to enhance the incredibly important work they do with children and families. This conference is sponsored partially by John P. Ellbogen Foundation for Excellence in Early Childhood Education. Join over 200 mental health professionals, school counselors, social workers, and early childhood teachers for this hands-on conference. Learn innovative methods during intensive workshops from renowned experts in play therapy, Dr. Jeff Ashby and J.P. Lilly! Earn up to 24 CEU's for participating in the entire conference.